Medical vertical form fill seal - This machine will make Tyvek chevron pouches and four sided sealed pouches in various heat sealable materials. Medical products can be either manually loaded or automatically loaded with auto loader systems. Makes Tyvek pouches and foil pouches. The Vertical medical Tyvek chevron pouch forming machine, can be a standalone form fill seal machine, with manual medical product loading, or automatic product loading system. The Vertical- form fill seal pouch former will automatically load products into Tyvek chevron or foil pouches as they are being made. Form fill seal in a small economic machine. Diagnostic test kits are examples of products that care packaged by this form fill seal. The Medical vertical form fill seal pouch former can save labor and improve quality. Medical vertical form fill seal machinery - Medical form fill and seal machinery, makes peelable chevron Tyvek pouches and 4 sided foil pouches. 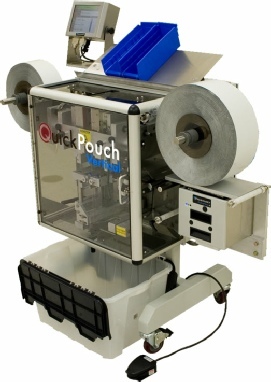 Manual and automatic loading of medical devices into Tyvek pouches ,and diagnostic test kits into foil pouches. Can make up to 12 x 15 inch pouches. Machine dimensions - 45" W x 43.5" T x 23" D Weight 220 lbs.